Introducing the New Hubbard Fellows! We have entered the second year of our Hubbard Fellowship program. Eliza Perry and Anne Stine completed their Fellowships earlier this season, and we brought in two new Fellows, Jasmine and Dillon, on June 2nd. They have seen and learned a lot in their first month or so with us, and have agreed to introduce themselves and share some of their early perspectives here in their first of many blog posts. Dillon’s essay is first, followed by Jasmine’s. Dillon Blankenship and Jasmine Cutter (with her new hat!) at The Nature Conservancy’s Niobrara Valley Preserve. Dillon Blankenship is an Arkansas native and graduated from Hendrix College in 2012 with a B.A. in Biology and a B.A. in Environmental Studies. 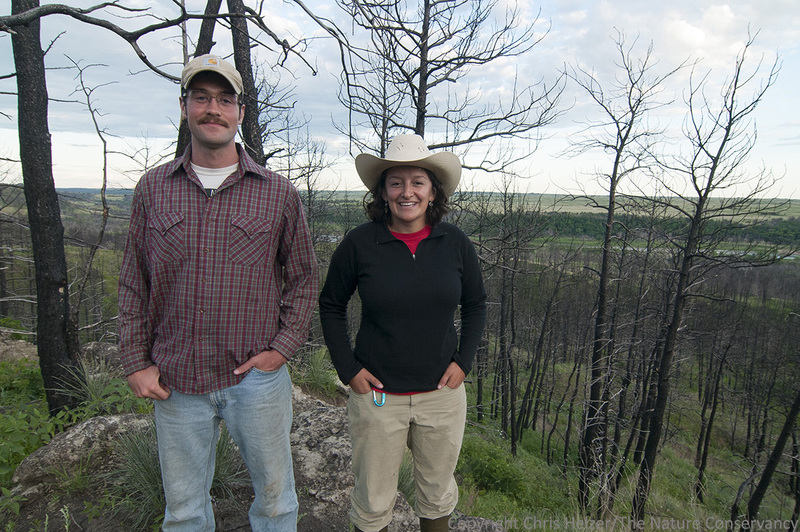 He has studied native pollinators at The Nature Conservancy’s Zumwalt Prairie Preserve in Oregon and has volunteered with TNC in Arkansas where he helped burn and monitor the effects of burning. He earned a Thomas J. Watson Fellowship in 2012, and spent a year studying honey bees and hive management. His travel took him to England, Wales, Tanzania, Egypt, India, Russia, and Germany. Growing up in northwest Arkansas I was always on the cusp of the Great Plains. My home was definitively in “the woods,” but we shared a property boundary with a neighbor’s herd of bison. I was so close, but I can’t say I had a lot of real contact with prairies until college when I took a summer research position with Oregon State University. They had me chasing native bees in diverse ecosystems across the state, but working on the 33,000 acre Zumwalt Prairie Preserve was, by far, the highlight. I was completely awestruck by the landscape’s expansiveness. Wildflowers stretched to the horizon and I marveled at how, despite the gently undulating hills and absence of trees, it was still possible to lose oneself. While different from the prairie in eastern Oregon, I have thoroughly enjoyed the last five weeks in Wood River. I identify with the rural-ness out here and am consistently taken by the beauty of our prairie. Stewardship is rewarding work. When I chop a musk thistle or pull up poison hemlock I can see the immediate impact of my effort. I know these actions are a mere drop in the conservation bucket (and that there is often a sad, high possibility of another invader filling the spot I just opened with my spade), but applying my knowledge and skills to real management is something I have been craving for the last few years. I am excited to be in the fray of the conservation profession. Researchers come through with interesting projects, new conservation issues arise for discussion, and I get to be a part of it now. I am excited for all the new experiences and opportunities for professional development that await. Already, I have learned a lot – the depth with which I look across the landscape has probably quintupled. I am recognizing species that were completely foreign when I arrived and am beginning to make inferences about how the land is functioning and responding to the various pressures we place on it. 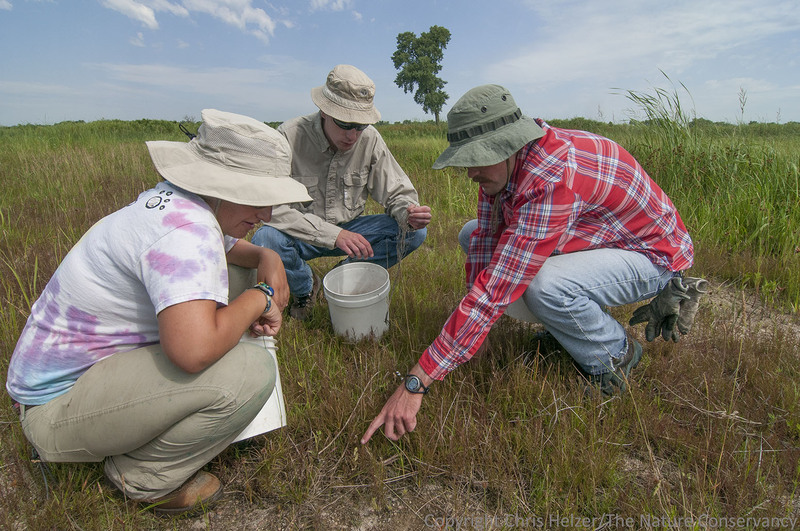 Jasmine and Dillon, along with intrepid volunteer, Sam Sommers (middle) work on some plant identification in the Platte River Prairies. Jasmine Cutter grew up in Delaware but is a 2013 graduate of Carleton College in Minnesota. She has a B.A. in Environmental Studies and most recently was working as a research assistant in the Greater Yellowstone Area, surveying mountain goats and bighorn sheep. Jasmine has conducted several pollinator surveys as a research assistant, and she has extensive experience as an interpretive educator when she served with Americorps at White Clay State Park in Delaware and with “Kids for Conservation” and the Science Olympiad in Minnesota. I first fell in love with prairies in Minnesota. At first I think I liked the novelty – that there could be a landscape that was grass, flowers, and sky – and no trees! As an east-coaster that was pretty crazy. Although there was plenty to see aboveground, I was awed when I first learned that the extent of prairie plants’ roots are often 2-3 times greater than what is visible above. I marveled that these huge root systems allow plants to regrow after fires, and to contribute to the regeneration and retention of nutrients. In addition, I was fascinated by the human aspect of how intentionally-set fires perpetuated the prairies, and how the agricultural productivity of the midwest (and great plains) has been enabled by the rich prairie soils. For all of these reasons – aesthetic, ecological, cultural – I am excited to be in Nebraska. Already it’s hard to keep track of everything we’ve done. For the most part, we’ve been subduing musk thistles, but we’ve also been catching small mammals (cute photos to follow, I promise), tearing down windmills, learning our plants, cleaning ATVs, meeting TNC people from across the country, building bottomless tanks, hosting a field day, swabbing tadpoles, planting our garden, and learning how TNC functions. I am really excited to build competency in many areas that I currently know nothing about: livestock/grazing, vehicle and tool maintenance, driving large machines, and learning the nitty-gritty of how to plan and assess restoration projects. Although we have big shoes to fill, I’m also looking forward to this blog, and to a chance to hear from all you folks. I greatly value the comments that I have read on previous posts, and I know that they have enhanced my understanding of many topics – so please share your expertise and insights! This entry was posted in Hubbard Fellowship and tagged claire m hubbard, dillon blankenship, fellowship, foundation, hubbard fellowship, jasmine cutter, nebraska, prairie, the nature conservancy by Chris Helzer. Bookmark the permalink. Welcome Jasmine and Dillon. I look forward to spending time with you. Welcome and congrats on this great opportunity! Great posts, guys! So so so so excited for you both! Welcome Dillon and Jasmine, and congratulations! I’m looking forward to following your adventures during the next year. Hi, Dillon! Jay was reading The Prairie Ecologist (one of his favorite websites), and he saw that you are one of this year’s Hubbard Fellows! Congratulations! We are very excited that you have this tremendous opportunity and know you’ll use it to further the good you’re doing in the world! Jay and I hope you’ll come back to the Shenandoah Valley and share some of your experiences with us. Until then, we wish you all the best!